Army Updates Sexual Assault Policy, Sgt. 1st Class Shaun Herron, Army News Service, November 23, 2004. Collaboration with Civilian Authorities for Sexual Assault Victim Support, David S. C. Chu, U.S. Department of Defense, Washington, DC: December 17, 2004. Collateral Misconduct in Sexual Assault Cases, David S. C. Chu, U.S. Department of Defense, Washington, DC: November 12, 2004. Commander Checklist for Responding to Allegations of Sexual Assault, David S. C. Chu, U.S. Department of Defense, Washington, DC: December 15, 2004. Confidentiality Policy for Victims of Sexual Assault, Paul Wolfowitz, U.S. Department of Defense, Washington, DC: March 16, 2005. Data Call for CY04 Sexual Assaults, David S. C. Chu, U.S. Department of Defense, Washington, DC: November 22, 2004. David Chu and Debby Tucker Discuss the Pentagon’s New Sexual Assault Policies (transcript and audio), All Things Considered, National Public Radio, Washington, DC: January 7, 2005. Copyright © 2005 National Public Radio. DEFENSE TASK FORCE ON Sexual Harassment and Violence at THE MILITARY Service Academies, U.S. Department of Defense, Washington, DC: August 25, 2005. Department of Defense Definition of Sexual Assault, David S. C. Chu, U.S. Department of Defense, Washington, DC: December 13, 2004. DOD Announces New Policy on Prevention and Response to Sexual Assault (transcript from news briefing), U.S. Department of Defense, Washington, DC: January 4, 2005. Charts from briefing. DOD Sexual Assault Policy ~ SUMMARY, U.S. Department of Defense, Washington, DC. DOD SEXUAL ASSAULT TASK FORCE LEAD APPOINTED, U.S. Department of Defense, Washington, DC: February 13, 2004. Essential Training Tasks for a Sexual Assault Response Capability, David S.C. Chu, U.S. Department of Defense, Washington, DC: April 26, 2005. FACT SHEET ON AIR FORCE PLAN FOR PREVENTION OF AND RESPONSE TO SEXUAL ASSAULT, National Statistics on Sexual Assault, U.S. Air Force, Washington, DC: August 24, 2005. Increased Victim Support and A Better Accounting of Sexual Assault Cases, David S. C. Chu, U.S. Department of Defense, Washington, DC: November 22, 2004. National Sexual Assault Awareness and Prevention Month – April 2005, Charles S. Abell, U.S. Department of Defense, Washington, DC: April 6, 2005. New Civilian / Military Task Force Focuses on Sexual Violence and Harassment in the Military; Delilah Rumberg Selected as Co-Chair, Susan Lewis, The Resource, National Sexual Violence Resource Center, Enola, PA: Fall / Winter 2004. The Report Concerning the Assessment of USAF Sexual Assault Prevention and Response, Office of the Assistant Secretary of the Air Force, U.S. Air Force, Washington, DC: August 2004. Response Capability for Sexual Assault, David S. C. Chu, U.S. Department of Defense, Washington, DC: December 17, 2004.
Review of Administrative Separation Actions Involving Victims of Sexual Assault, David S. C. Chu, U.S. Department of Defense, Washington, DC: November 22, 2004. SECOND ANNUAL REPORT ON THE SEXUAL ASSAULT PREVENTION AND RESPONSE PROGRAM – EXECUTIVE SUMMARY, U.S. Department of Defense, Washington, DC: 2006. Sexual Assault Policy Letter to Congress, David S. C. Chu, U.S. Department of Defense, Washington, DC: January 3, 2005. Sexual Assault Prevention, Response Report Released, Tech. Sgt. David A. Jablonski, Air Force Print News, August 30, 2004. Sexual Assault Prevention and Response, Donald Rumsfeld, U.S. Department of Defense, Washington, DC: May 3, 2005. SEXUAL ASSAULT PREVENTION AND RESPONSE (SAPR) PROGRAM DIRECTIVE & INSTRUCTION, Gordon England, U.S. Department of Defense, Washington, DC. 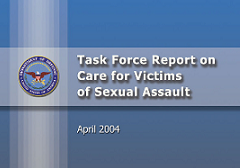 Task Force Report on Care for Victims of Sexual Assault, U.S. Department of Defense, Washington, DC: April 2004. Training Standards for DOD Personnel on Sexual Assault Prevention & Response, David S. C. Chu, U.S. Department of Defense, Washington, DC: December 13, 2004. Training Standards for Pre-Deployment Information on Sexual Assault and Response Training, David S. C. Chu, U.S. Department of Defense, Washington, DC: December 13, 2004. Training Standards for Sexual Assault Response Training, David S. C. Chu, U.S. Department of Defense, Washington, DC: December 17, 2004.